5 AIRMEN KILLED AS LOADED AF TANKER DESTROYS 2 BUILDINGS. 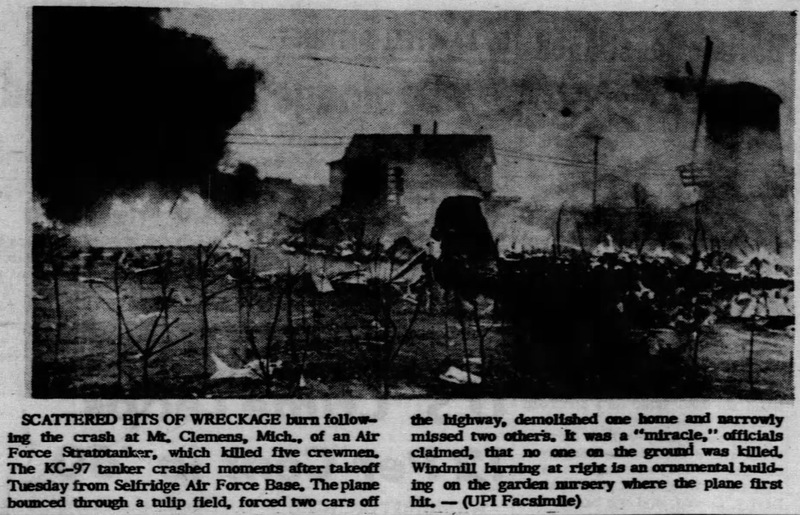 Mount Clemens, Mich. (AP) -- A loaded Air Force tanker plane smashed in a flaming smear across a busy highway late Tuesday, destroying two buildings and narrowly missing a tavern and a tulip farm house. The pilot had just veered his stricken ship, loaded with 9,500 gallons of fuel, away from a crowded housing project. The pilot, LT. JOHN C. BIBBLE, 24, Urbana, Ill., and the four other airmen aboard lost their lives. 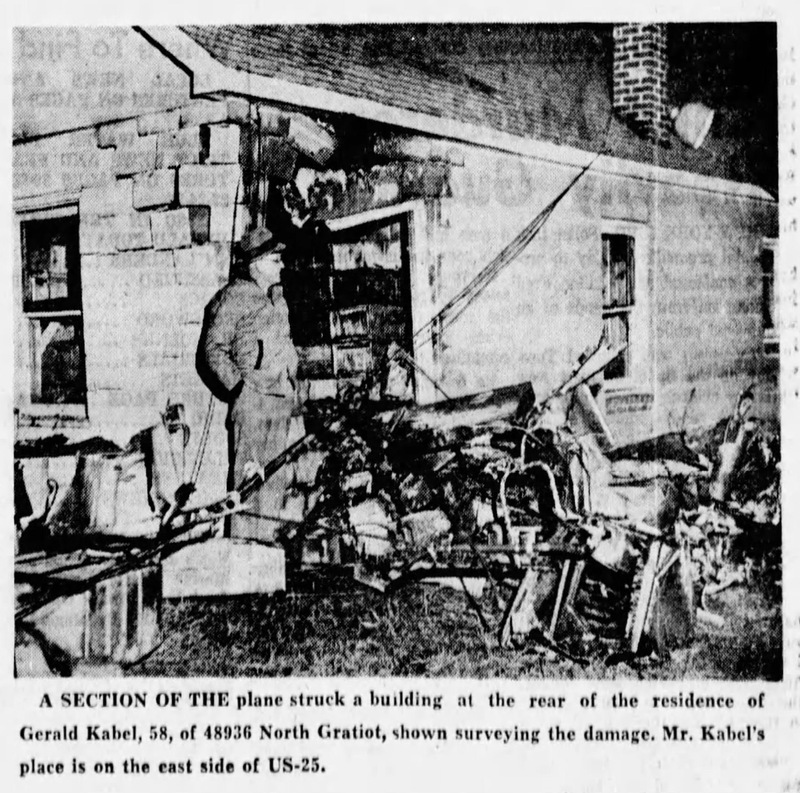 A housewife, RUTH KING, 32, said the four-engine, prop-driven KC97 from nearby Selfridge Air Force base struck "in a great big billow of flame and smoke." The big pot-bellied ship, crashing moments after takeoff, left a wake of burning wreckage. Pieces hung from overhead power lines and clogged U.S. 25, the highway leading from nearby Detroit. An Air Force spokesman said the ship was on a routine refueling missioin when it apparently suffered a power failure on target. The ship veered away from a Selfridge Base housing project of 380 units and staggered along at treetop level as LT. BIBBLE sought an empty place to put it down. It clipped a tree and knocked off part of its tail. Killed with LT. BIBBLE were CAPT. LYDELL M. HAYGOOD, 29, Hawthorne, Calif., aircraft commander; T.SGT. ROBERT E. DERBY, 38, Tacoma, Wash., flight engineer; S. Sgt. ERNEST J. LEMOINE, III, 29, Houston, boom operator; and LT. ROBERT L. LEWIS, 24, Manchester, Conn., navigator. HARRY WILSON of New Baltimore, Mich., said he was driving down nearby Sugarbush Road when the plane flew across in front of him. "When I first saw it, it was so low that I knew it must be in trouble. Then I saw part of the tail portion had already been knocked off. It must have already hit something," WILSON said. The plane bounced across a field in flames, stopping just across U.S. 25. It passed just in front of an auto, which drove through the flames. "He almost got me," the driver, unidentified, told JAMES BRAZELTON, 23, as he leaned against the auto. The driver's wife remained inside, hysterical, BRAZELTON said. That's a weird one, Dave. I cant find any info on it! So there is available docs on it and it is a KC-97. Chris, Thanks for the link to more info. It is strange that so little info is available about this one. I plan on requesting documents from the Air Force Safety Center and now AFRA. 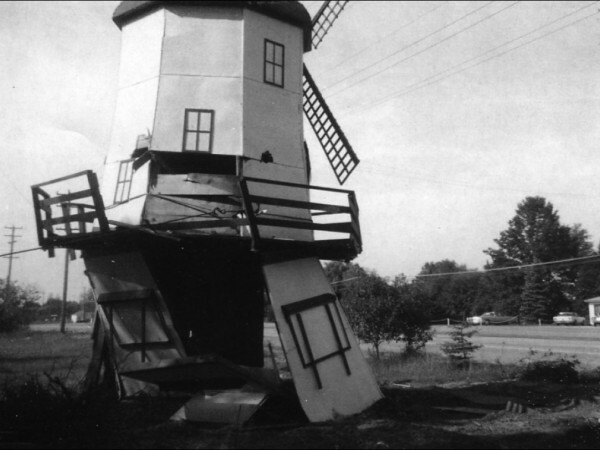 Given the extent of the crash I would think that wreckage would be around in the field north and east of the base of the old windmill. The New Baltimore(MI) Patch did a retrospective on it in 2012. Pics attached. It looks like the Port Huron Times-Herald and the Detroit Free Press have extensive articles on it but I am not a newspapers.com subscriber so I cannot download them. As a side note: Rene Deceunick is mentioned in the article (having just left a nearby tavern!) he is distantly related to me by marriage (he is my uncle's wife's uncle...if that makes any sense). The entire side of my mom's family is from the area. 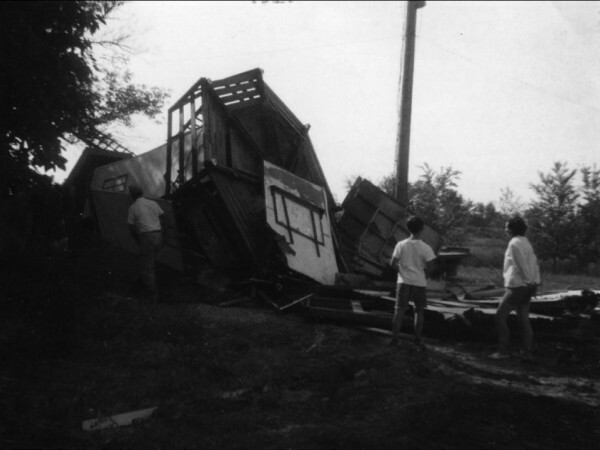 My mom was 12 years old at the time and her best friend lived in the house next door to the one that was destroyed. Jeff, I got some of the info I posted from newspapers.com, I am a subscriber, the saved papers are too big to post, but if you or Dave, or someone else needs them, I can send them via e-mail. I saved them as jpg, not pdf though. 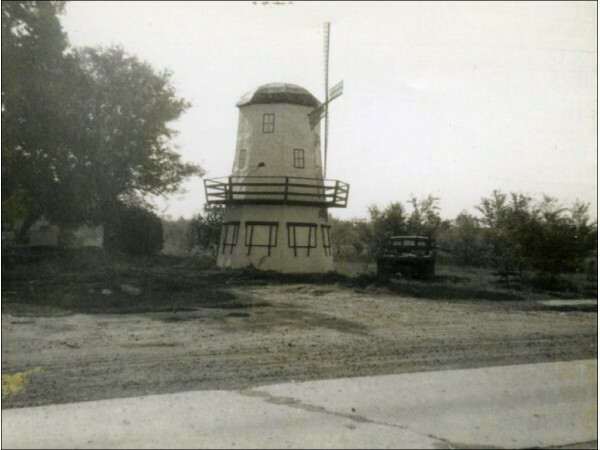 The base of the windmill I found by searching the address of the tulip farm given in the paper and there it was on the aerial imagery! 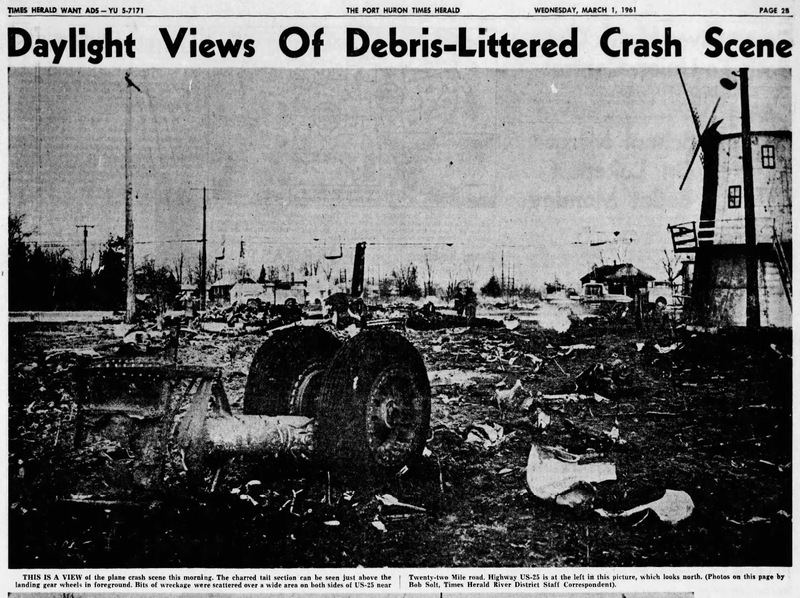 More than fifty five years later, I visited the crash site to see what has changed since the accident and tried and discover any evidence at the scene. I feel confident that I have located the crash site in this now urban area. Some things have changed at the site, but evidence can still be found there. I was able to match up some of the photos pretty good. I am the granddaughter of one of the men killed in this crash. I have some of his AF personnel records. He was in the 307th Air Refueling Squadron. Found this board while researching my family. Thank you larryschuitema for your input. Yes you are correct that the crew saved base housing, but sacrificed themselves. That is why it is important to remember them and that is why I researched, located the crash site and wrote a story about them. It’s lovely to hear such kind words about my grandfather. He left my grandmother with 5 kids - it was hard for them. But great the hear he is remembered. He has a memorial in OKC as well.